A Family on Elephantine Island, Egypt Fifth Century B.C.E. Eight hundred years after Moses led the Exodus, Jews had returned to Egypt. Jewish Life in Ancient Egypt: A Family Archive from the Nile Valley tells the story of Ananiah, a Jewish temple official, and his wife, Tamut, an Egyptian slave. Ananiah and Tamut lived on Elephantine (pronounced Elephan-TEE-nee), an island in the Nile River, in the fifth century B.C.E. Evidence suggests that they lived in a cosmopolitan, multicultural, and multilingual society tolerant of religious and ethnic diversity; interfaith marriage was not uncommon. Ananiah and Tamut’s story may seem familiar—they married, bought a house, and raised two children—yet their world also included slavery and animal sacrifice to the gods. 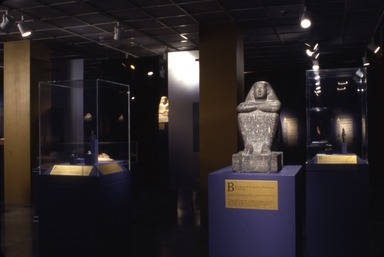 The Egyptian and Persian antiquities in these galleries illustrate the historical and religious issues that shaped the lives of Ananiah and Tamut. Due to the Biblical prohibition against imagemaking, specifically Jewish objects from this period are virtually unknown. One possibly Jewish object, a sarcophagus lid, is included in this presentation. 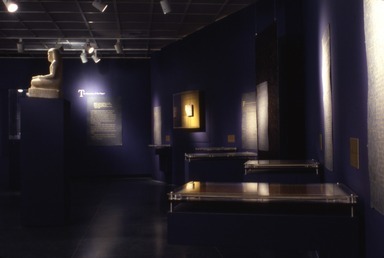 The culmination of this exhibition is Ananiah and Tamut’s family archive, a set of eight papyri created between 449 and 402 B.C.E. These papyri, written in Aramaic, allow a fascinating glimpse into the daily life of this couple, and include evidence for active Jewish involvement in Egyptian culture. Along with similar archives now housed in Berlin and Oxford, the Brooklyn papyri are the oldest extra-Biblical evidence for Jews in ancient Egypt. And Jehovah will send you back to Egypt…and you will have to sell yourselves there to your enemies as slaves, and there will be no buyer. The Hebrew Bible describes the Jews’ return to Egypt in 586 B.C.E. as part of a divine punishment, but documents, including the archive of Ananiah and Tamut on view in this exhibition, reveal a prosperous community. By 586 B.C.E.., there may have been Jews already living in Egypt: More than a hundred years earlier, King Hezekiah of Judah (727–697 B.C.E.) had sent mercenaries to his Egyptian allies. Other worshipers of Jehovah might have settled in Egypt when the Northern Kingdom of Israel was destroyed in 722 B.C.E. Although Ananiah was a temple official, most of the Jews in Elephantine were government soldiers. Jews lived peacefully among the Egyptians and the Persians, who conquered Egypt in 525 B.C.E. The Persians, who commanded the building of the Second Temple in Jerusalem, were famous for their religious and ethnic tolerance; and the period of Persian rule is remarkable for its lack of ethnic tensions. And the entire people… and the officers of the soldiers, arose and came to Egypt, because they were afraid of the Babylonians. By the rivers of Babylon/There we sat/Also we wept/When we remembered Zion. The [Persian] King Cambyses came to Egypt….He gained mastery over this entire land….I made his royal titles as King of Upper and Lower Egypt. According to the Hebrew Bible, Babylonians destroyed Solomon’s Temple in Jerusalem in 586 B.C.E. The Babylonians invaded, in part, because of the earlier destabilization in Judah caused by Pharaoh Necho II (610–595 B.C.E.). When the Persians conquered Egypt in 525 B.C.E., they brought an official policy of religious and ethnic tolerance with them. 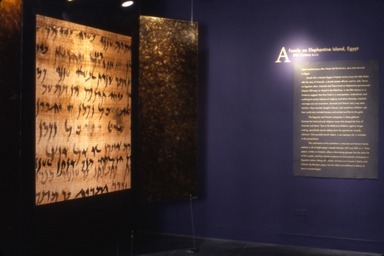 Ananiah and Tamut, whose lives are documented in the Brooklyn Aramaic papyri, lived during this harmonious period. As the inscription quoted above demonstrates, Egyptians acknowledged the Persian rulers as traditional pharaohs. Some officials who had served previous Egyptian kings continued in office under the Persians. Jews were loyal to the Persians because they restored the Temple in Jerusalem. The Persians established a policy permitting religious and ethnic diversity throughout their empire. Two hundred years later, Alexander the Great arrived in Egypt (323 B.C.E.) and founded a new capital at Alexandria. Originally, the term “Jew” referred to the residents of the territory of Judah, one of three areas that made up the United Monarchy ruled by Kings Saul, David, Solomon, and their successors. During the Persian Period in Egypt (Dynasty 27, 525–404 B.C.E. ), the term was, as it is today, both a religious and ethnic designation. Just like modern-day Jews, the Jews of ancient Egypt worshiped Jehovah (YHWH in Hebrew), observed the Sabbath, and celebrated the Feast of Matzah (modern Passover). However, the Jews of Elephantine certainly did not have many of the standard interpretations of Jewish law followed today. The Talmud and other official interpretations of Biblical law were written hundreds of years after Ananiah and Tamut lived so, rituals on Elephantine, including animal sacrifice, should not be judged by today’s standards. It is not clear whether Ananiah and Tamut were familiar with the Law, Prophets, and Writings in the form of the canonical Hebrew Bible. The text of these books was not set until 70 C.E., more than five hundred years after Ananiah and Tamut lived. The Jews of Elephantine did not take names from the Biblical patriarchs Abraham, Isaac, and Jacob, but rather created names compounded with Jehovah. Ananiah’s name, for example, means, “Jehovah will answer” in Aramaic. This suggests that they may not have been familiar with the book of Genesis. Ancient Judaism and Egyptian religion were similar in structure. Egyptians and Jews sacrificed animals and offered incense to a god in order to receive protection. Both groups worshiped male and female deities that were sometimes thought of as family units. Although the Jews in Elephantine worshiped the same God Jews do today, they attracted the prophet Jeremiah’s condemnation for they also worshiping the Queen of the Heavens, probably as God’s spouse. This goddess had a separate temple across the river. In legal documents, the Elephantine Jews also swore oaths by a variety of other gods. The Egyptians maintained the cult of Khnum, symbolized by the ram. Khnum was worshiped widely as a creator god but was especially important in Elephantine because he was seen as responsible for the annual Nile flood. Rams were also important to Jews in Elephantine, and both Jews and Egyptians sacrificed rams to their gods. This common sacrificial practice might have added to mutual understanding. No other clear archaeological evidence documenting Jewish rituals and practices in Elephantine exists, but there is evidence that Jews in Egypt followed some Egyptian funerary practices, such as using anthropoid coffins. Some even decorated the coffin with images of Isis and Nephthys, the Egyptian goddesses of mourning. Some Jews used the same types of terracotta coffins that poor Egyptians used. ASSOUN, January 26–February 13, 1893: All these papyri from Kôm, shown me by three separate women at different times. In 1893, Egyptian farmers found the archive of Ananiah and Tamut on Elephantine Island, near Aswan. Charles Edwin Wilbour, the pioneering American Egyptologist, purchased eight papyrus rolls that same year and placed them in a tin biscuit box for storage. The box was placed in the bottom of a trunk with his other Egyptian papyri. After Wilbour’s death three years later, the papyri were forgotten. In 1947, Theodora Wilbour, Charles’s daughter, found the trunk and donated the contents to the Brooklyn Museum of Art. The papyri were in excellent condition, with seven of the eight rolls still sealed. They were opened, studied, and published in 1953. Along with similar archives now in Berlin and Oxford, the Brooklyn papyri provide the earliest extra-Biblical documentation of Jews in ancient Egypt. [King Nebuchadnezzar] said to them: “There is a dream that I have dreamed and my spirit is agitated to know the dream.” At that the Chaldeans spoke to the king in the Aramaic language. 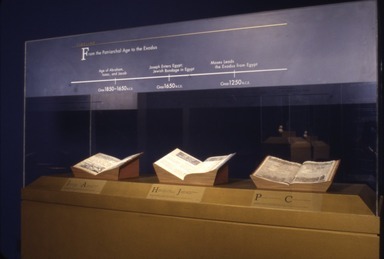 The Aramaic language used in these papyri was known to the writers of the Bible both as the language of the Chaldeans, a Near Eastern people, and a language known to the Hebrew Patriarchs. Aramaic was also the international language used by Assyrians and Babylonians in the twelfth century B.C.E. As these papyri demonstrate, the Jews living in Elephantine during the fifth century B.C.E. spoke Aramaic. It continued to be spoken and written as a diplomatic language during the Persian Empire as late as the fourth century b.c.e. By 300 B.C.E., Aramaic was commonly spoken by the Jews of Jerusalem and the Torah was translated from Hebrew to Aramaic for their benefit. Passages in the Biblical books Daniel and Ezra are in Aramaic rather than Hebrew. Dialects of Aramaic are still spoken today in Iraq and Syria. The script used to write Aramaic in ancient times is related to the script used to write Hebrew. December 7, 2001 Eight hundred years after Moses led the Exodus, Jews were once again settled in Egypt. In this remarkable period, Jews, Egyptians, Persians, and Greeks lived together in relative peace. Through the nearly miraculous preservation of ancient papyri from one Jewish settlement on Elephantine Island, and other ancient works of art, visitors to the Brooklyn Museum of Art can look back at Jewish Life in Ancient Egypt. 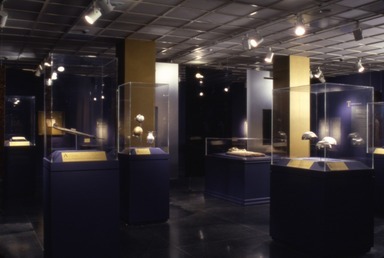 Jewish Life in Ancient Egypt focuses on the Brooklyn Museum of Art’s collection of fifth century B.C.E. 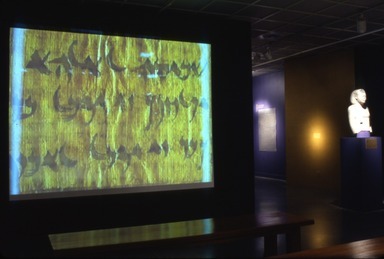 Aramaic papyri, revealing Egyptian daily life during Dynasty 27 (525–402 B.C.E.) - the period of Persian rule in Egypt and the Near East. In addition to 8 of the best-preserved papyri, the exhibition includes 41 works of ancient Egyptian and Persian art from the Museum’s collection that are related to the topics addressed in the papyri. The objects include life-size statues, reliefs, bronze statuettes, silver vessels and gold jewelry. The papyri are a family archive that belonged to a Jewish temple official, Ananiah, his wife, Tamut, an Egyptian slave, and their children. 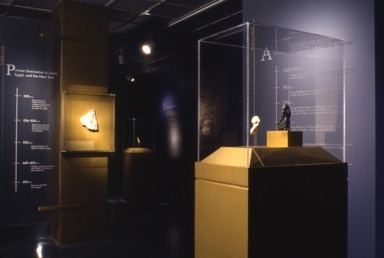 The exhibition illustrates their family life from their marriage in 447 B.C.E. to the final payment on their daughter’s wedding gift in 402 B.C.E. In between these events we learn about marriage, labor conditions, real estate, religion, and burial in a multi-cultural community comprising Egyptians, Jews, and Persians. 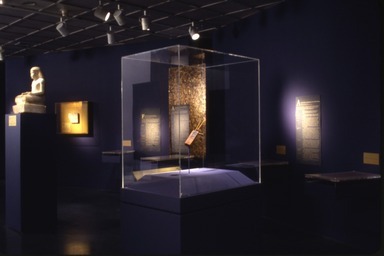 The papyri in the exhibition were written in Aramaic, the daily language of the Jews and Persians of Egypt. Professional scribes, familiar with the legal formulas that were used in real estate transfers, marriage documents, and loan documents wrote the body of these documents using the same materials and reed pens familiar to Egyptian scribes. A close look at the bottom of the papyri shows that the witnesses signed the documents in their own hands. 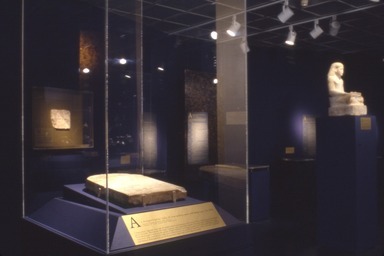 Among the papyri included in the exhibition are the Marriage Document of Ananiah and Tamut, dated July 3, 449 B.C.E. ; Freedom for Tamut, dated June 12, 427 B.C.E. ; Anania Gives Tamut Part of a House, dated October 30, 434 B.C.E. ; and Ananiah Sells a House to His Son-in-Law, dated December 13, 402 B.C.E. 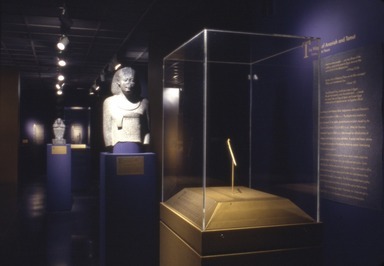 In addition to papyri, the exhibition Jewish Life in Ancient Egypt contains a number of statues of royalty, priest[s], soldiers, and officials. 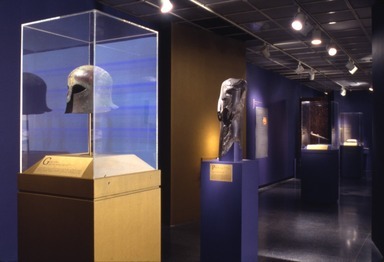 Among these include a statue of the renowned Greek conqueror Alexander the Great, from the first century B.C.E. ; a statuette of King Necho from the Late Period, Dynasty 26 (ca. 610–595 B.C.E. ); a Ram-Headed Egyptian God Seated on a Throne, from Dynasty 26 or later, an Egyptian Priest Kneeling with Offering Table, from the New Kingdom (1539–1075 B.C.E. ); a scribe statue of Amenhotep, Son of Nebiry, from Dynasty 18, Reign of Amenhotp II (1426–1400 B.C.E. ); and a Lid of a Sarcophagus, from the Late Period. 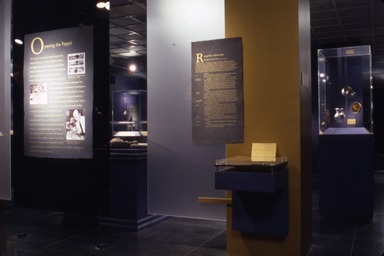 The exhibition also illustrates the historical background and culture of the period. The community, located on Egypt’s southern border, was surprisingly modern in its tolerance of diverse ethnic groups. Intermarriage was common and people had many of the same concerns then as now. The papyri also reveal details of Egyptian slavery and the practice of Judaism in ancient times. The Persians, conquered Babylonia in 539 B.C.E. and Egypt became part of their empire in 525 B.C.E. The Persians permitted Jews in Babylon to return to Jerusalem and rebuild the Temple, while other Jews remained in Egypt. In Elephantine, these Jews were members of the mercenary forces guarding Egypt’s southern frontier. They lived peacefully among the native Egyptians, the Persians, and Greek mercenaries in a multi-cultural, multi-lingual society. The curator of Jewish Life in Ancient Egypt is Edward Bleiberg, Associate Curator of Egyptian, Classical, and Ancient Middle Eastern Art at The Brooklyn Museum of Art. Jewish Life in Ancient Egypt is made possible, in part, by The Joseph S. and Diane H. Steinberg Charitable Trust, The Judy and Michael Steinhardt Foundation, and the Leo and Julia Forchheimer Foundation. 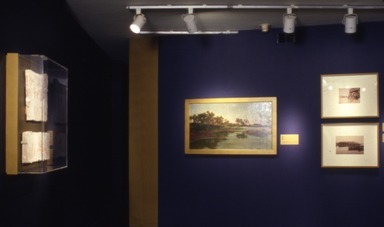 Additional support is provided by the Barbara and Richard Debs Exhibition Fund of the Brooklyn Museum of Art.